This Electronic Cash Register comes with the register, cash drawer and the receipt printer. The Sam4s SPS 530 is designed for reliability. 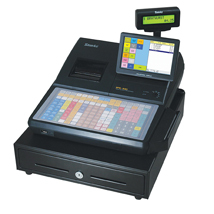 The Electronic Cash Register system is flexible with a built in point of sales software. The SPS 530 is a retail hardened Electronic Cash Register built to function in the harshest environments. The SPS 530 can be set up and installed at a lower cost and in less time that a PC based POS system. The SPS 530 has many features: flat or raised keyboard, 7" TFT-LCD color touch screen, and a high speed built in thermal printer. 2 line customer display, time Clock option, and to 60,000 price look ups. Additional memory can be added (#9708) Optional Credit Card Reader can be purchased (#9707. Accurate pricing via bar code scanning (#9709 or #9710. Mix and Match discounts. 5 reporting buckets. ECR`s are more secure than PC based POS systems.